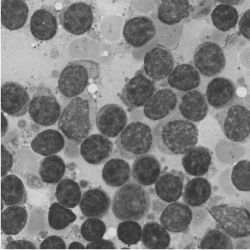 Progressive proliferation of abnormal leukocytes found in hemopoietic tissues, other organs, and usually in the blood in increased numbers. Leukemia is classified by the dominant cell type, and by duration from onset to death. This occurs in acute leukemia within a few months in most cases, and is associated with acute symptoms including severe anemia, hemorrhages, and slight enlargement of lymph nodes or the spleen. The duration of chronic leukemia exceeds one year, with a gradual onset of symptoms of anemia or marked enlargement of spleen, liver, or lymph nodes. acute leukemia leukemia in which the involved cell line shows little or no differentiation, usually consisting of blast cells; it comprises two types, acute lymphocytic leukemia and acute myelogenous leukemia. acute granulocytic leukemia acute myelogenous l.
acute lymphoblastic leukemia (ALL) one of the two major categories of acute leukemia, characterized by anemia, fatigue, weight loss, easy bruising, thrombocytopenia, granulocytopenia with bacterial infections, bone pain, lymphadenopathy, hepatosplenomegaly, and sometimes spread to the central nervous system. It is subclassified on the basis of the surface antigens expressed, e.g., B-cell type, T-cell type. acute lymphocytic leukemia acute lymphoblastic l.
acute megakaryoblastic leukemia , acute megakaryocytic leukemia a form of acute myelogenous leukemia in which megakaryocytes are predominant and platelets are increased in the blood. acute monocytic leukemia an uncommon form of acute myelogenous leukemia in which the predominating cells are monocytes. 1. a common type of acute myelogenous leukemia in which myeloblasts predominate; it is divided into two types on the basis of degree of cell differentiation. acute myelocytic leukemia acute myelogenous l.
acute myelogenous leukemia (AML) one of the two major categories of acute leukemia, with symptoms including anemia, fatigue, weight loss, easy bruising, thrombocytopenia, and granulocytopenia. 1. acute myeloblastic l. (1). acute myelomonocytic leukemia a common type of acute myelogenous leukemia, with both malignant monocytes and monoblasts. 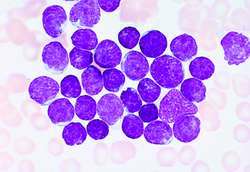 acute nonlymphocytic leukemia acute myelogenous l.
acute promyelocytic leukemia acute myelogenous leukemia in which more than half the cells are malignant promyelocytes. acute undifferentiated leukemia (AUL) acute myelogenous leukemia in which the predominating cell is so immature it cannot be classified. adult T-cell leukemia/lymphoma (ATL) an adult-onset, subacute or chronic malignancy of mature T lymphocytes, believed to be caused by human lymphotropic virus type I.
aleukemic leukemia a form in which the total white blood cell count in the peripheral blood is not elevated; it may be lymphocytic, monocytic, or myelogenous. basophilic leukemia leukemia in which the basophilic leukocytes predominate. chronic leukemia leukemia in which the involved cell line is well differentiated, usually B lymphocytes, but immunologically incompetent. chronic granulocytic leukemia chronic leukemia of the myelogenous type, usually associated with a specific chromosomal abnormality and occurring in adulthood. chronic lymphocytic leukemia (CLL) chronic leukemia of the lymphoblastic type, characterized by lymphadenopathy, fatigue, renal involvement, and pulmonary leukemic infiltrates. chronic myelocytic leukemia , chronic myelogenous leukemia, chronic myeloid leukemia chronic granulocytic l.
chronic myelomonocytic leukemia a chronic, slowly progressing form characterized by malignant monocytes and myeloblasts, splenomegaly, and thrombocytopenia. leukemia cu´tis a cutaneous manifestation of leukemia resulting from infiltration of the skin by malignant leukocytes. eosinophilic leukemia a form in which eosinophils are the predominating cells. hairy cell leukemia chronic leukemia marked by splenomegaly and an abundance of large, mononuclear abnormal cells with numerous irregular cytoplasmic projections that give them a flagellated or hairy appearance in the bone marrow, spleen, liver, and peripheral blood. histiocytic leukemia acute monocytic l.
lymphatic leukemia , lymphoblastic leukemia, lymphocytic leukemia a form associated with hyperplasia and overactivity of the lymphoid tissue, with increased levels of circulating malignant lymphocytes or lymphoblasts. lymphogenous leukemia , lymphoid leukemia lymphatic l.
lymphosarcoma cell leukemia (B-cell type) acute lymphoblastic l.
mast cell leukemia a rare form marked by overwhelming numbers of tissue mast cells in the peripheral blood. megakaryoblastic leukemia acute megakaryocytic l.
micromyeloblastic leukemia a form of myelogenous leukemia in which the immature nucleoli-containing cells are small and similar to lymphocytes. monocytic leukemia acute monocytic l.
myelocytic leukemia , myelogenous leukemia, myeloid granulocytic leukemia a form arising from myeloid tissue in which the granular polymorphonuclear leukocytes and their precursors predominate. See also acute myelogenous l. and chronic granulocytic l.
myelomonocytic leukemia acute myelomonocytic l.
plasma cell leukemia , plasmacytic leukemia a form in which the predominating cell in the peripheral blood is the plasma cell. 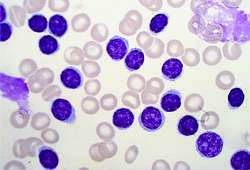 promyelocytic leukemia acute promyelocytic l.
Rieder cell leukemia a form of acute myelogenous leukemia in which the blood contains asynchronously developed cells with immature cytoplasm and a lobulated, relatively more mature nucleus. stem cell leukemia acute undifferentiated l.
a group of malignant neoplasms of hematopoietic tissues characterized by diffuse replacement of bone marrow or lymph nodes with proliferative white blood cell precursors. Peripheral blood WBC counts become elevated and immature or variant forms appear in the peripheral blood. Leukemia may be chronic or acute, lymphoid, myeloid, or erythroid. In some chronic leukemias, when untreated, the WBC count becomes grossly elevated and the blood may appear whitish, giving leukemia its name. Also spelled leukaemia. See also acute childhood leukemia,acute lymphocytic leukemia, acute myelocytic leukemia. leukemic, adj. Progressive proliferation of abnormal white blood cells found in hemopoietic tissues, other organs, and usually in the blood in increased numbers. Leukemia is classified by the dominant cell type, and by duration from onset to death, which occurs in acute leukemia within a few months in most cases, and is associated with acute symptoms including severe anemia, hemorrhages, and slight enlargement of lymph nodes or the spleen. The duration of chronic leukemia exceeds 1 year, with a gradual onset of symptoms of anemia or marked enlargement of spleen, liver, or lymph nodes. A cancer of blood cells characterized by the abnormal increase in the number of white blood cells in the tissues. There are many types of leukemias and they are classified according to the type of white blood cell involved. John Hughes, English physician, 1812-1875.
n a group of chronic or acute malignant disorders characterized by an abnormal increase in the number and types of white blood cells; permeation of liver, lymph nodes, and spleen; replace-ment of bone marrow with proliferating precursors to white blood cells. Lethargy, paleness, loss of weight, and easy bruising are early signs. Fever, extreme weakness, hemorrhages, and pain in the joints or bones may be later indications. An intensive combination of chemotherapy, antibiotics, and blood transfusions or bone marrow transplant is currently the most effective treatment. n malignant blood disease, where healthy blood cell numbers are reduced while underdeveloped cells and lymphoblasts proliferate in blood vessels, bone marrow, lymph nodes, and organs. One of the most common malignancies in children. n cancer of hematopoeitic tissues common in older men distinguished by proliferation of lymphocytes, especially B cells. Symptoms include malaise, weight loss, fatigue, nighttime sweating, and lymphadenopathy. Progressive proliferation of abnormal leukocytes found in hemopoietic tissues, other organs, and usually in the blood in increased numbers; classified by dominant cell type, and by duration from onset to death. This occurs in acute leukemia within a few months in most cases, and is associated with acute symptoms including severe anemia, hemorrhages, and slight enlargement of lymph nodes or the spleen. Chronic leukemia lasts over 1 year, with a gradual onset of symptoms of anemia or marked enlargement of spleen, liver, or lymph nodes. n a usually fatal disease of the blood-forming tissues characterized by the abnormal proliferation of leukocytes and their precursors and attended by fatigue, weakness, fever, lymphadenopathy, splenomegaly, and a tendency toward profuse tissue hemorrhage. Oral lesions include gingival enlargement, severe gingivitis, and necrosis. Lymphatic, monocytic, and myelogenous leukemias are the main types. 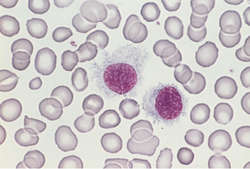 n a phase of the leukemic state marked by proliferation of leukocytes within the blood-forming tissues but without an increase in the white blood cell count: relatively few precursor cells are found in the blood smear until the phase passes and the blood becomes flooded with white cells. Oral lesions, when present, are ulceronecrotic and hypertrophic. n a hyperplasia, of undetermined origin, affecting lymphoid tissue. Predominating cells are lymphocytes and lymphoblasts. Generally assumes a more chronic course than other forms of leukemia but may be acute. Oral lesions include swollen and hyperplastic gingivae, ulceronecrotic lesions, and marked tendency to gingival hemorrhage. n a form characterized by an abnormal increase in the number of monocytes. Manifestations include progressive weakness, anorexia, lymphadenopathy, hepatomegaly, splenomegaly, and secondary anemia. Oral lesions may be ulceronecrotic or hemorrhagic. n a form in which the leukocytes are of bone marrow origin (e.g., polymorphonuclear leukocytes, myelocytes, myeloblasts). Oral manifestations may include gingival enlargement, hemorrhage, and necrosis. a progressive, malignant disease of the blood-forming organs, marked by distorted proliferation and development of leukocytes and their precursors in the blood and bone marrow. Signs include fever and enlargement of the lymph nodes, spleen and liver. The persistent lymphocytosis that occurs in some cattle is a response to infection with the bovine viral leukosis virus. Similarly, leukemia may occur in the lymphoproliferative and myeloproliferative diseases caused by feline leukemia virus in cats. leukemia in which the leukocyte count is normal or below normal. leukemia in which basophilic granulocytes predominate. leukemia arising from B lymphocytes. skin lesions associated with dissemination of systemic leukemia; they may be neoplastic or nonspecific. occurs rarely in cats. There are large numbers of eosinophils with infiltration of spleen, liver, lymph nodes and bone marrow. the array of diseases associated with infection of cats by the feline leukemia virus; includes lymphoreticular neoplasms, myelodysplastic disorders and abnormalities of the immune system. leukemia associated with hyperplasia and overactivity of the lymphoid tissue, in which the leukocytes are lymphocytes or lymphoblasts. a form marked by large numbers of lymphosarcoma cells in the peripheral blood; depending on the degree of bone marrow involvement, it may be a variant of lymphosarcoma. a form marked by overwhelming numbers of tissue mast cells in the peripheral blood. a rare disease of young dogs, characterized by intestinal hemorrhage, anemia and a fatal outcome within a few weeks. There is a pancytopenia and marked thrombocytopenia. a form with numerous megakaryocytes in the spleen, bone marrow, and other tissues, but decreased numbers or abnormal thrombocytes in the peripheral blood, and anemia. Reported in dogs and cats. Called also megakaryocytic myelosis. leukemia in which the predominating leukocytes are monocytes. characterized by a predominance of immature myeloid series of cells in the blood; largely a disease of young male dogs and cats. a form arising from myeloid tissue in which the granular polymorphonuclear leukocytes and their precursors predominate. concurrent neoplasia of the neutrophilic and monocytic cell lines with a monocytic leukemia, a high total leukocyte count, anemia and thrombocytopenia. a form in which the predominating cell in the peripheral blood is the plasma cell. a form in which the predominant cells are premyeloblasts, rather than myeloblasts, often associated with abnormal bleeding secondary to thrombocytopenia, hypofibrinogenemia and decreased levels of clotting factor V.
characterized by a predominance of promyelocytes in peripheral blood and in the bone marrow. A disease of dogs and cats with bleeding tendencies, anemia and a susceptibility to septicemia with a fatal outcome within a few weeks. 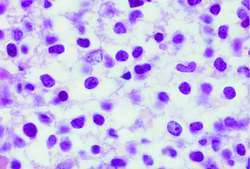 leukemia in which the predominating cell is so immature and primitive that its classification is difficult. an acute myeloproliferative disorder in which the cells involved cannot be identified. Q. What causes Leukemia? How can one get Leukemia? A. Not all the causes of leukemia are known. However there are some causes that are suspected. Nowadays as the pollution is increasing and use of chemicals in various parts of life has increased, people who come in contact with toxic chemicals, radiations etc. are at greater risk of developing leukemia, hereditary also plays a role at some extent.